Yugoslavia, 1991, and Casca is recruited by the fledgling Croatian state to undertake a covert mission to kill a warlord called Vardaric before he can commence a campaign of terror by carrying out a systematic ethnic cleansing of captured Croatian territory. To Casca, a.k.a. 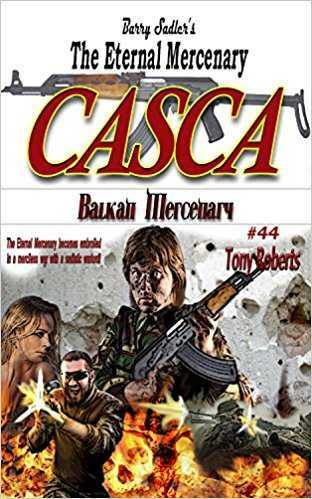 Casimir Lonjic, the mission has an extra incentive, for Vardaric had carried out a raid on Casca’s Thai hideout a few years previously, killing his woman and destroying all he had built up over the years. So while the former Yugoslav states of Croatia and Serbia go to war with one another, Casca goes to war on Vardaric. With a team of nine other mercenaries, Casca is sent into the warzone to take out Vardaric and his company of killers, but unknown to Casca, there are two members of his squad with agendas of their own, each different to one another. It is only when members of his team are murdered that Casca begins to realise things are not what they seem. It is only after an epic chase across Bosnia that Casca had the chance to uncover the truth and confront not one, but two deadly enemies from his past.